O - Scale Train Table (could be for any scale - we had O-scale on it) HO-scale?? Used this on Lionel 027 track. I used a commercial degreaser and 3M pad prior to applying the product to clean the rails. 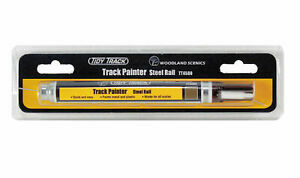 The paint would adhere to some track but not to all. The color is transparent and is more rust color than the steel rail grey that is on the tube. Also it did not cover as much rail as I thought it should. Long story short, I went to an art supply store and bought an oil based Sharpie paint marker. It was less than half the price of the Tidy Track painter. Was not transparent, and covered twice the area with a much better end result. Hope this helps.